I’m a member of People’s Coop and every week they send me an email about their Wednesday farmer’s market. (Yes, it goes on through the winter.) This week they featured chickweed, which is pretty silly. Why would anyone buy chickweed at a farmer’s market? Why would someone even grow it as a crop, when it’s a weed that grows everywhere? I saw it on a hike in the Gorge this weekend; I saw it just now walking through the PSU campus. I tried chickweed for the first time yesterday while I walked in a mope to the grocery store. My account balance is at zero and I’m running very low on food stamps. I intended wild food foraging to be a pleasure and a supplement to my fresh food budget, but it’s getting more necessary at a point where I can’t afford to buy leafy greens. I saw a few stalks growing at the base of a tree and ate them. Then I saw some growing under the eave of a building and in a planting strip and in a landscaped area maintenance hadn’t weeded lately. Chickweed isn’t bad. It doesn’t have the crispy texture of lettuce, but it does taste very salady. Maybe something like spinach? Sure. That’ll do. However, I have yet to find a large supply that I can bundle up and take home for a salad. I’d really like to mix some chickweed with some leftover shelled edamame, salt, balsamic vinegar, and olive oil. People’s Coop recommends making a pesto out of chickweed, but I can only find enough to mush up into a minute puddle. In that sense, buying a bag of chickweed (does it come in bags?) seems practical, but no way. It’s free botanical trash I can put in my mouth and free is the best part. Here is a great guide to identifying chickweed by Becky Lerner of First Ways. She has a book coming out in April titled Dandelion Hunter. Edit: I have seen chickweed at the People’s farmers’ market for up to $8 per pound. Since writing this post, I’ve found some great sources of chickweed for foraging, but I’ve been having some trouble enjoying the stiffness of the stems. Edit 2: I learned from a lecture by John Kallas of Wild Food Adventures that only the tips of chickweed should be harvested and consumed. It gets too fibrous after about and inch and a half. Also chickweed is past its prime once it flowers, but still quite good. 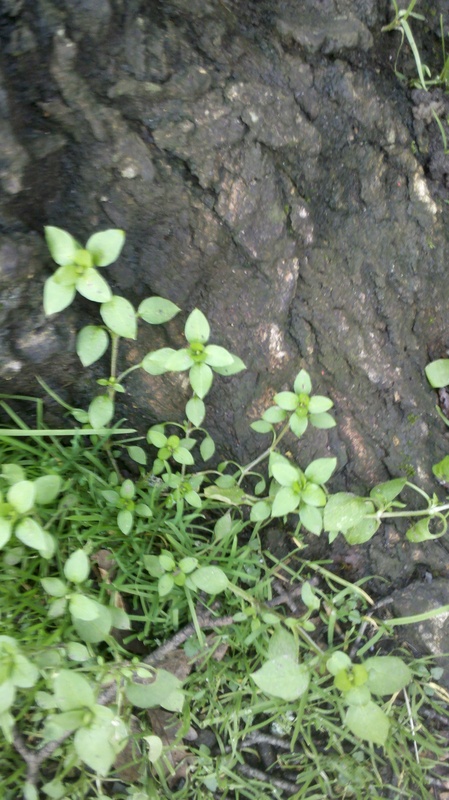 The camera phone picture of the chickweed was not lousy, it was actually pretty good :)! Lauren, you’re awesome. It does make me laugh to see things like chickweed for sale when, as you said, it’s so abundant for free! Thanks so much for linking to my post! Dandelion greens are pretty good and plentiful too, head to the park! Have you ever been a gleaner? There’s places around where me & my roommate get a lot of free produce and greens to supplement our household. This starving writer things is no joke sometimes. It’s enough to make you go out and buy a bag of chickweed . . .